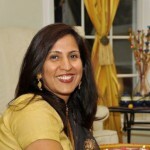 I am very excited to introduce you all to my long time friend and Home Chef extraordinaire Ruchika Panjwani. Ruchika, I am so happy that you consented to be my first interview for this new segment. I have been a long time fan of your cooking and every time we have been guests at your table, I look forward to the experience. It is my honor to be able to share you and your talent with the readers of my blog. Ruchika, tell me something about yourself. Hello, I love my family and friends and enjoy pampering them with good food. I live life in the moment and surely enjoy every minute of it. At the current moment trying my best to balance my life between a full-time job and two teenagers and their very busy schedules. The first thing I remember cooking was Chili Chicken probably when I was 18. I had joined a cooking class in Mumbai, India and in the very first class they taught us to make Chili Chicken. I invited a few of my cousins the very first weekend after I had learned it and they raved so much about it, which gave me immense pleasure. To be honest, have quite a few favorites, some of which are Chicken Lollipops, Biryani, and Spicy Mutton Curry. My least favorite food is anything made with green beans. One of my favorite Indian cooks is Sanjeev Kapoor and I also follow Rachael Ray, and Ina Garten. One of my favorite cuisines is Thai (& luckily, the entire family’s favorite) and have a few favorite restaurants. The casuals are Olieng (Thai) in NYC and Pure Thai Cook House also in NYC. Among the Indian restaurants; I love the food of Chand Palace and Mehndi. My 2 favorite recipes are Orange Lemon Cake and Bhindi Masala. Grease a 10inch Bundt pan and preheat oven to 325 degrees. In a large bowl, stir together pudding and cake mix. Make a well in the center and pour in ¾ cup orange juice, oil, eggs and lemon extract. Beat on low speed until blended. Scrape bowl, and beat 4 minutes on medium speed. Pour batter into prepared pan. Bake in preheated over for 40 to 60 minutes. Let cool in pan for 10 minutes, then turn upside down and cool completely. 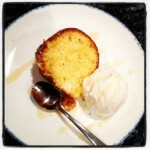 In a saucepan over medium heat, cook 1/3 cup orange juice, sugar and butter for 2 minutes, drizzle over cake. This was a great recipe. I found all the ingredients and it was easy to make and follow. I even got my 7-year-old son to help. I used a dark, non-stick Bundt pan and cooked my cake for 40 minutes. It came out perfect. I found that making the glaze took more than 2 minutes for me… I cooked it for around 7 minutes and I did notice that it got thicker as it cooled. I served the cake with vanilla ice cream and drizzled some more glaze over it. It was delicious and my husband and kids (2 and 7years ) loved it. I had guests over for dinner that day and they took some back home with them. Love the citrus flavor. Moist and delicious! Right level of moistness and the crust was perfect. The glaze made it excellent. Normally not a big fan of the citrus cake, but I loved it! 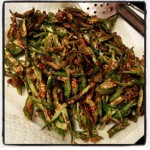 Cut Bhindi into long slanted pieces and deep fry. Don’t make it too crisp. In a kadai (wok) add oil, jeera, green chilies and sauté onions (the pieces don’t have to be too fine). Add bell pepper and cook for 5 minutes covered. Add the Bhindi pieces and dry masala i.e. Amchur, dhania-jeera powder, salt, haldi and red chili powder. Add tomato and 1/2 cup milk or cream. Don’t mix too much or it gets soggy. Sprinkle 1/2 tsp. garam masala and garnish with fresh chopped cilantro in the end. Make this recipe when you have time, as the prep work is lengthy. I washed and dried the okra before slicing it. I deep-fried the okra in batches, as I wanted to minimize the amount of oil I used. It took about 8 minutes on high to get the required doneness. Once the okra was ready, putting the rest together was quick and easy. It took me about an hour to make the dish, including prep work and frying. 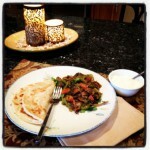 I served my Bhindi Masala accompanied with Paratha (Indian flat bread) and plain yogurt. Loved the Bhindi Masala. Liked the variation combination of the tomatoes and the Bhindi and just loved it! 2 tsp. Oil, and some more for deep-frying the okra. 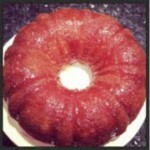 Wow Ruchika………….both your recipes look tempting and delicious! I’m certainly going to try out both. Just reading through it made my taste buds water. Keep the recipes flowing!! All the best. Thank Iris for your kind words. Please do let me know how it turns out. Best wishes. Hi Ruchika, I tried your Bhindi Masala recipe and it won my wifey’s heart. Thanks a lot for sharing a way to win over family and friends!